More fun for dogs, less strain for you. This fetching toy can launch over 200 feet (or as close as ten feet) just by swinging its stretchy cord. Dogs get their exercise and you don't have to exert that throwing arm. The non-toxic rubber ball bounces and floats like a tennis ball, but unlike a tennis ball, you don't have to touch anything slobbery‚ you only have to handle the cord. My border collie loves the bunjiball, and I love throwing a non-slobbered toy! It’s strong, it’s well-made and lots of fun!! Guess my dog was too young she would fetch the Bunjiball but chew on the end until it came off. Bunjiball Maker Steve Petitt was feeling the wear and tear on his arm from throwing tennis balls for his fetch-loving dogs Champ and Sandy. So this former baseball player came up with a way for the dogs to still get the exercise they needed while giving his throwing arm a break. The bouncy Bunjiball gets its high-flying go from the strap that can launch it over 200 feet or as close as 10 feet. Just spin the stretchy cord and let it go—you control the distance. 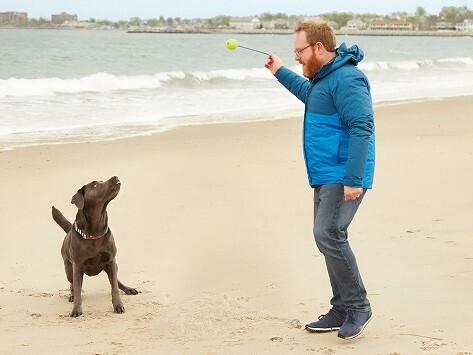 There's less effort (and less risk of strain) for you, and the ball can go super far for your dog to chase. Best of all? There's no touching anything slobbery. You only have to handle Bunjiball's cord.